Its been discovered by Anandtech that the new 2011 MacBook Air recently launched by Apple is fitted with a weaker Thunderbolt chip than other Apple systems such as the iMac, Mac Mini and MacBook Pro. 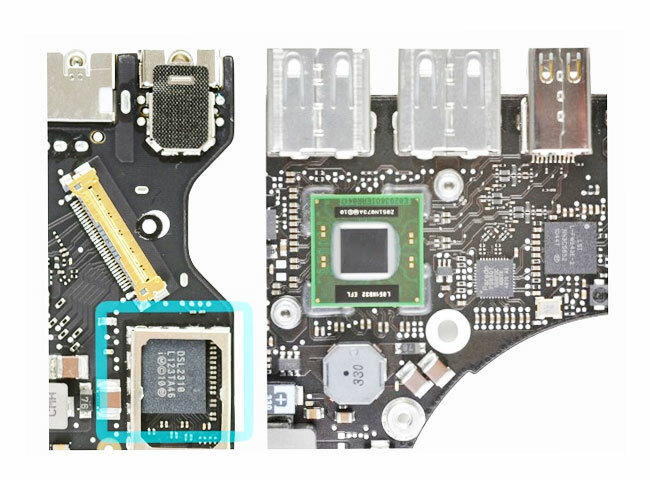 All systems apart from the MacBook Air use a full sized Thunberbolt controller chip called the Light Ridge, but Anandtech have discovered the new 2011 MacBook Air is equipped with a less powerful and scaled down version of the chip called the Eagle Ridge. The weaker Thunderbolt chip has probably been included by Apple in the slim MacBook Air to save space and power and shouldn’t cause too many problems to users, unless you are looking to daisy chaining two monitors. As the Eagle Ridge will not support more than one external monitor, or you need to push larger amounts of data as the weaker chip will only support transfer speeds slower than the full Thunderbolt chip that is capable of data speeds of up to 10 Gbps of bi-directional traffic.